Phenylbutazone for Horses is a non-steroidal anti-inflammatory drug (NSAID) used to treat pain and inflammation associated with fractures, arthritis, and painful injuries to the limbs and joints. Phenylbutazone requires a prescription from your veterinarian, and is sold by the tablet. Phenylbutazone is a non-steroidal anti-inflammatory drug (NSAID) which through its anti-inflammatory action can relieve pain, reduce inflammation and reduce fever. Do not give Phenylbutazone to pregnant or lactating mares. 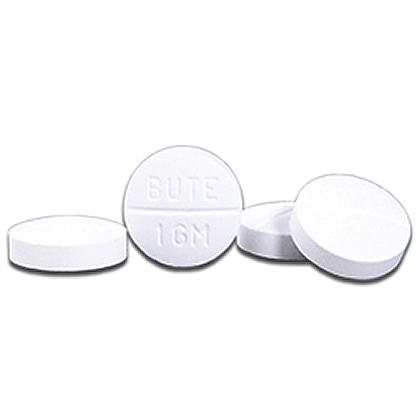 Do not give Phenylbutazone with other NSAIDs, corticosteroids, or other ulcer-causing medications. Phenylbutazone should not be given to horses that are dehydrated or have stomach ulcers, anemia, bleeding disorders, or liver, kidney or heart disease. Phenylbutazone is a prescription medication FDA approved for use in horses. It is available as 1 gram (1000 mg) scored tablets. The usual dose in horses is 2 to 4 Grams (2 to 4 tablets) per 1000 pounds every 24 hours. Phenylbutazone should be given with food. Phenylbutazone should not be given to animals who are dehydrated or have stomach ulcers; anemia or bleeding disorders; liver, kidney or heart disease. Phenylbutazone is a non-steroidal anti-inflammatory drug (NSAID) used to treat pain and inflammation associated with fractures, arthritis and painful injuries to the limbs and joints. Phenylbutazone may be used for purposes other than those listed in this medication guide. Tell your veterinarian if your horse has ever had an allergic reaction to phenylbutazone or any other NSAID. Tell your veterinarian if your horse has any liver, kidney or heart disease. Tell your veterinarian if your horse is pregnant or lactating. Give this medication exactly as directed by your veterinarian. If you do not understand the directions, ask your pharmacist or veterinarian to explain them to you. Tablets should be given with food. Store this medication at room temperature. Keep out of the reach of children and pets. Give the missed dose as soon as you remember. However, if it is almost time for the next regularly scheduled dose, skip the missed dose and give the next one as directed. Do not give a double dose of the medication. In the event of overdose, contact your veterinarian or veterinary emergency room. Symptoms of overdose may include decreased urine production and blood in the urine; jaundice (yellowing of the skin, gums and eyes); pale gums, weakness, and ulcers. Do not use phenylbutazone in animals allergic to it or other NSAIDs. Do not use in pregnant or lactating mares. Do not give phenylbutazone with other NSAIDs, corticosteroids, or other ulcer causing medications. Side effects that may occur when using phenylbutazone may include ulcers, kidney damage, bloody stool, decreased white blood cells and platelets as well as an allergic reaction (facial swelling, hives, sudden onset of diarrhea, vomiting, shock, seizures, pale gums, cold limbs, coma). Other side effects may also occur. Talk to your veterinarian about any side effect that seems unusual or bothersome to the animal. Use caution when giving phenylbutazone with phenytoin, warfarin, sulfonamides, glipizide, digoxin, barbiturates, rifampin, chlorpheniramine or diphenhydramine. Talk to your veterinarian or pharmacist before using phenylbutazone with any prescription or over the counter medications, including vitamins, minerals and herbal supplements. Your pharmacist has additional information about phenylbutazone written for health professionals that you may read. Phenylbutazone tablets for horses are a prescription medication available as 1 gram (1000mg) tablets. Phenylbutazone is a non-steroidal anti-inflammatory drug (NSAID) used to treat pain and inflammation associated with fractures, arthritis, and painful injuries to the limbs and joints. The maximum daily dose should not exceed 4 tablets (4 grams) per day. 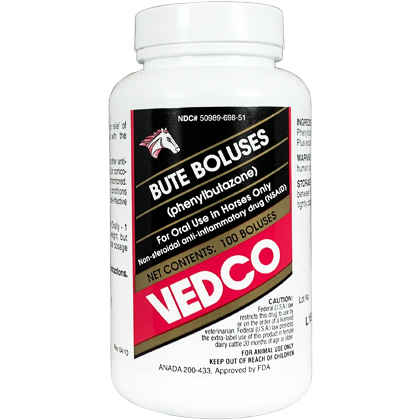 The oral dose for horses is two (2) to four (4) grams (2 to 4 tablets) per 1,000 lbs. of body weight every 24 hours. Store this product at room temperature, away from moisture and heat.